So, after my previous post, I chatted with some people on Twitter a bit then decided I finally had to get the Kindle for PC software. I’d resisted Amazon from the start, but now it was time to see what it was like. And I particularly wanted to see how it would contrast with my awful experience earlier today with Barnes & Noble. So, I hit download and the game was afoot! James Patterson is like the McDonald’s or Coca-Cola of mass fiction. If he sold most of his books in Kindle format, that settles it. This has implications far beyond one eBook format. This impacts public libraries now too. Nice try, IDPF and ePub. You lot better start defining the standard for web-based books. Although, given the rotten job you’ve done with books as files, stay the hell out of the next phase of books, OK? 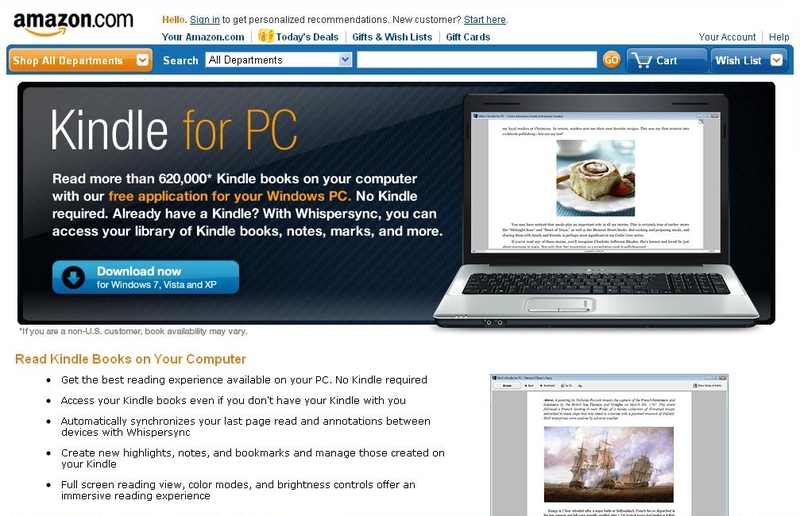 Amazon + Public Libraries = Uh-Oh! Do yourself a favor and stay the hell away from these things. Aside from the fact they’re all crappy fall-apart sucker bait, there is an important functional issue that makes them worthless: No Menu or Back buttons. I’ve gotten a report that states people who wasted their money on these wind up trying to use Aldiko for eBook reading — and become stuck! There’s no Menu button to call up the options for things like type size, etc. And once you’re in a book, you can’t go back to the Library to select another. Forget trying to get some sort of Sekrit Deal via China. That’s not going to happen, period. 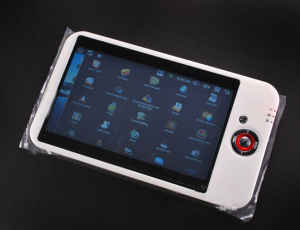 I’ve posted about the Pandigital Novel and the Cruze Reader and the Archos line of Android tablets. 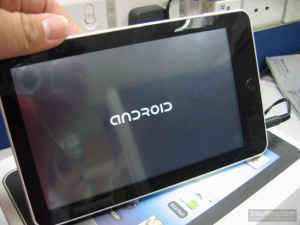 Stick with those if you desperately want/need want Android on a tablet. Twitter was filled with ridicule for Barnes & Noble promoting free classics. It even got several blog posts, one of which had this wonderful headline: Once again, B&N are giving away ebooks they don’t own. The Barnes & Noble Classics Series, available in both print and digital format, offers high-quality special editions at affordable prices, including a variety of carefully crafted extras. Barnes & Noble Classics eBooks offer proofed and well-formatted digital editions with introductions commissioned from today’s top writers and scholars, as well as author biographies, chronologies of contemporary historical, biographical, and cultural events, and footnotes and endnotes. Barnes & Noble Classics eBooks also include selective discussions of films and other content inspired by various works, comments by other famous authors, study questions to challenge the reader’s viewpoints and expectations, and bibliographies for further reading. Well, OK! That actually sounds good! 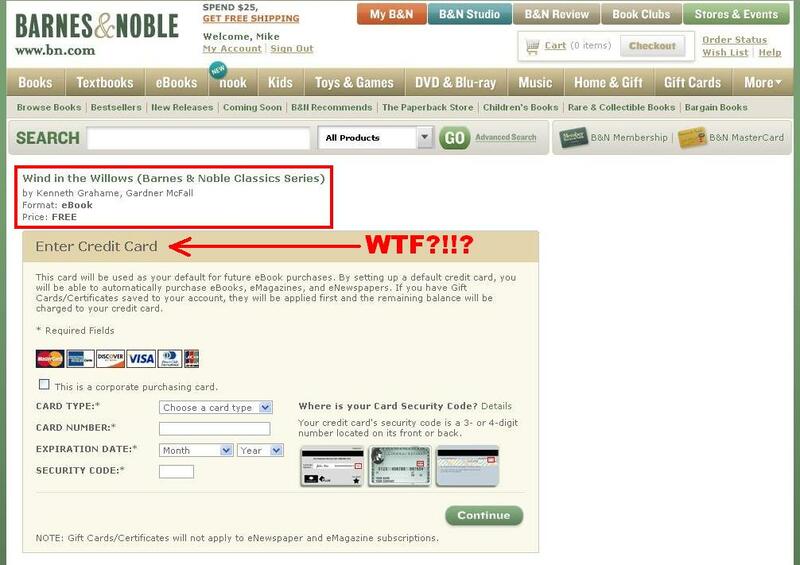 So I go to Barnes & Noble’s link to get these babies — and I’m asked to create an account. That’s the first FAIL. I screamed at Sony over this when they did it. If you say something is free, make it free. Don’t say you want something from me in exchange — that’s not free, that’s a trade! Well, I was stupid and gave Barnes & Noble the benefit of the doubt. Let me create an account and then maybe I can get these. That goes well. I even praise them on Twitter for not asking for a credit card (unlike when Sony did!). Now they want a credit card number — for something listed with a price tag of free! Stop this right now, Barnes & Noble. Change the entire procedure for those classics. Stop calling them free if people must create an account. And once they create that account, don’t ask for financial information! What are you thinking over there, Barnes & Noble? Don’t you realize that if people sample these are they’re actually superior to all others it becomes excellent marketing for your Nook, your bookstore, your brand, and future sales?